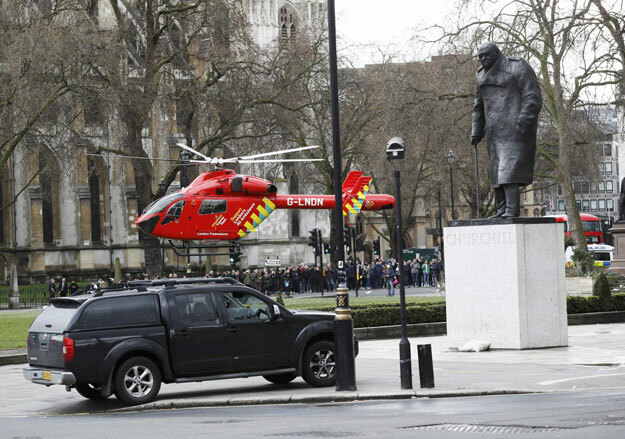 LONDON: A policeman was stabbed inside the perimeter of Britain’s parliament building on Wednesday, an assailant was shot outside and several people lay bleeding on a nearby bridge, Reuters witnesses and officials said. A Reuters photographer saw at least a dozen people injured on Westminster Bridge and photographs showed people lying on the ground, bleeding heavily. The number of casualties was unclear. Prime Minister Theresa May was safe after the incident, a spokesperson for her office said. He declined to say where May was when the attack took place. The leader of the House, David Lidington, said in the chamber that an assailant who stabbed a policeman had been shot by police. Amid confusing scenes, it appeared the incident may have unfolded in several locations, including the busy bridge where tourists often congregate to take pictures of Big Ben and other attractions. The incident took place on the first anniversary of attacks on Brussels in Belgium. Reuters reporters inside parliament said a large number of armed police, some carrying shields, were pouring into the building. Britain is on its second-highest level of “severe” meaning an attack by militants is considered highly likely. In May 2013, two British extremists stabbed to death soldier Lee Rigby on a street in southeast London. In July 2005, four British extremists killed 52 commuters and themselves in suicide bombings on the British capital’s transport system in what was London’s worst peacetime attack. Meanwhile, British police said the incident was being treated as “terrorist”. “We are treating this as a terrorist incident until we know otherwise,” police said in a statement.